Next week is Valentine’s Day! Are you ready? 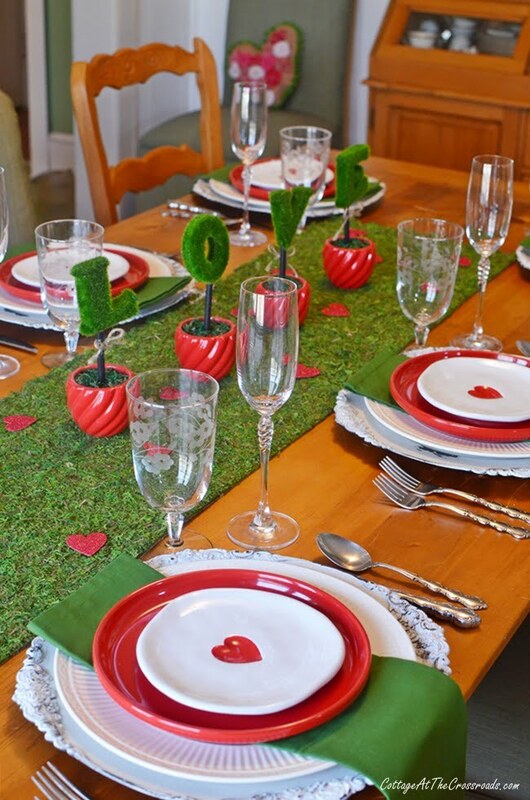 Today I’m sharing my Love in Bloom Valentine’s Day tablescape. Why am I calling it that, you ask? It’s all because of the centerpiece! As soon as I spotted these cute little ceramic pots with the moss covered letters that spelled out the word LOVE, I had to have them! 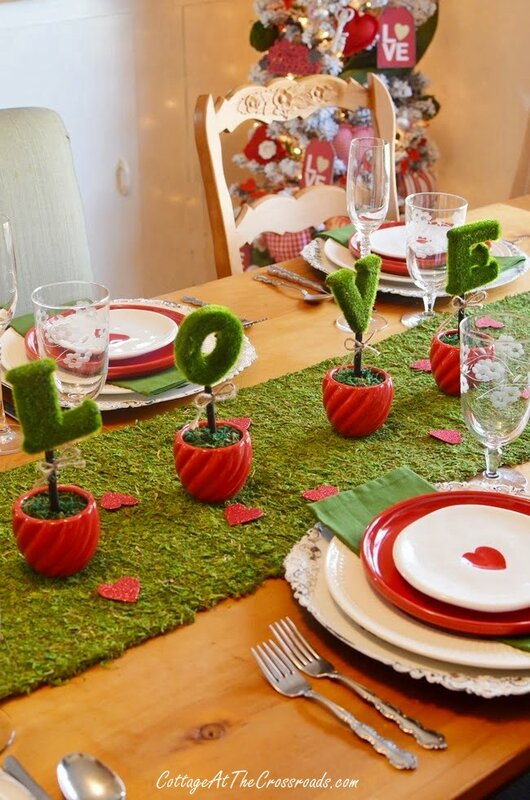 I thought they’d make a great, low profile centerpiece for a Valentine’s Day tablescape. You get it? LOVE is in bloom on this table! 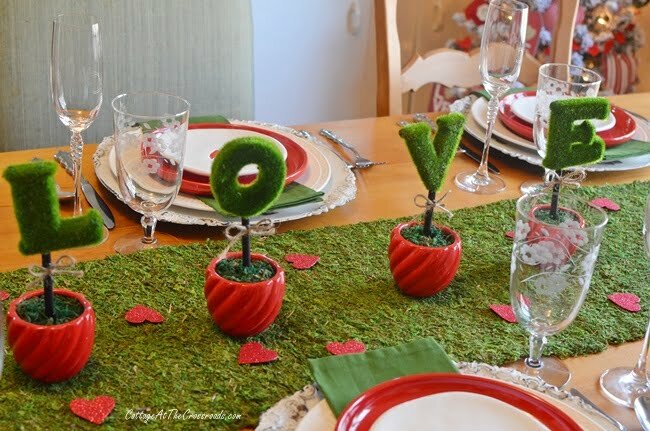 Because the pots are red and the letters are green, I chose to continue the red and green color scheme in this Valentine’s Day tablescape to the tree that is in the dining room. We’ve really enjoyed the glow of the lights from the tree throughout the month of January since we never got around to taking down the Christmas tree! 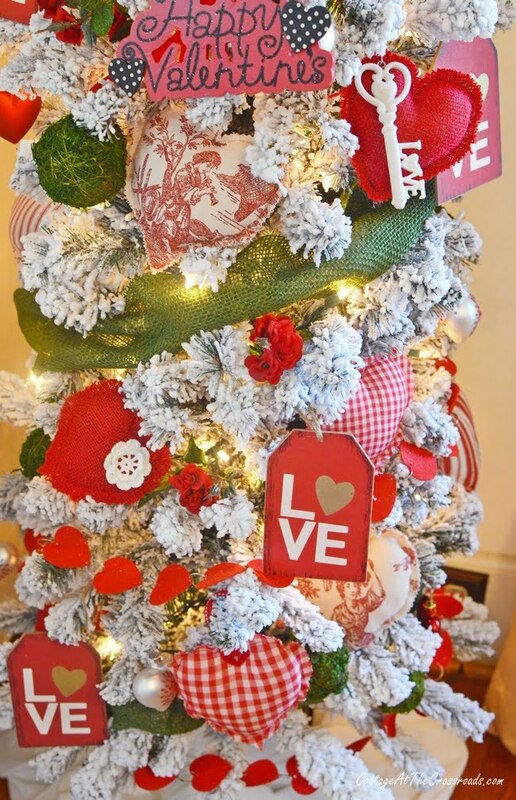 This closeup of some of the decorations on the tree show you how I used the colors of red, green, and white, of course. The table runner is a piece of green sheet moss that I cut to fit our narrow farmhouse table. Most of the things I already had but I did order these cute little white appetizer plates with the red hearts from Williams Sonoma. I just love their irregular shaped edges! The etched glasses belonged to my mother and she passed them along to me when she downsized into the little apartment we built for her in our backyard. The champagne flutes are ready to be filled with a cocktail composed of sparkling wine, pomegranate juice, and berries. 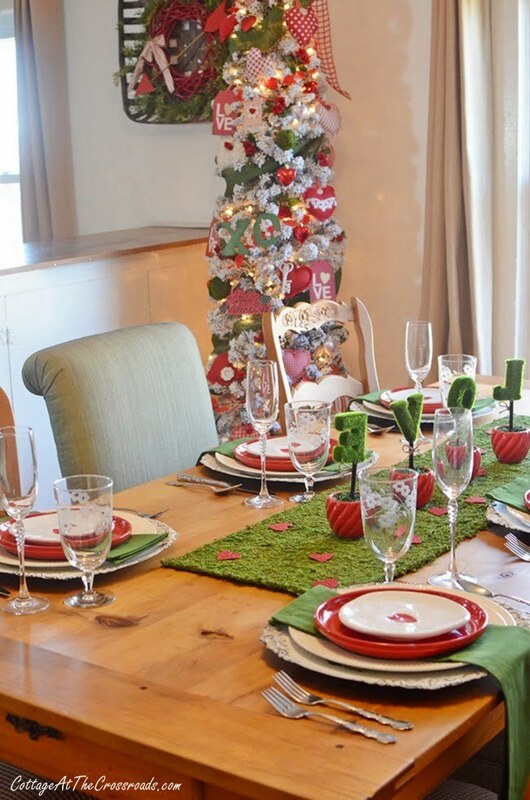 Whenever I set the table for a holiday, I coordinate the colors and decorations in the rest of the dining room. 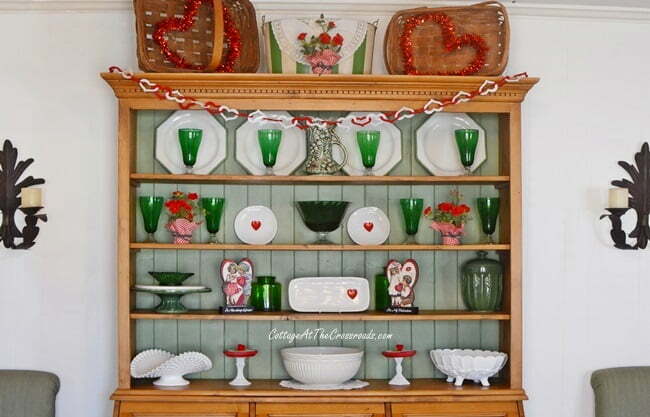 Here the pine cupboard is decorated with a mix of the same red, white, and green colors. Love these little vintage style cutouts! You just can’t have Valentine’s Day without roses, can you? 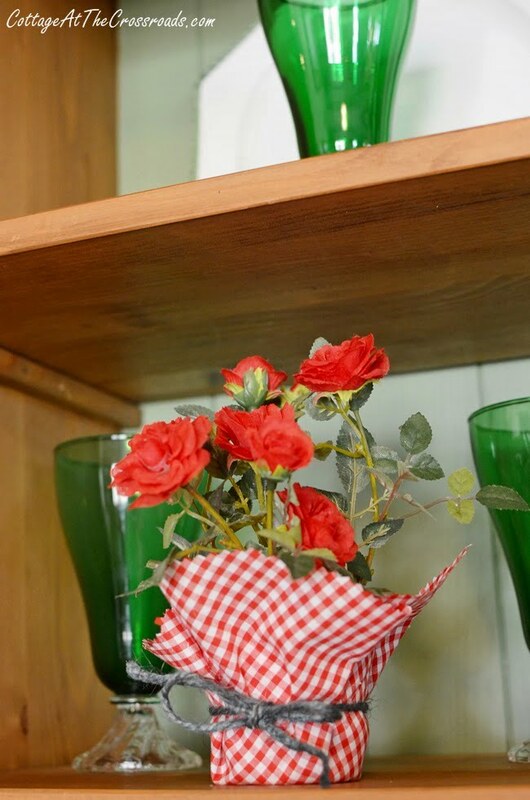 I found these faux rose plants in my stash and wrapped them with a little red gingham. 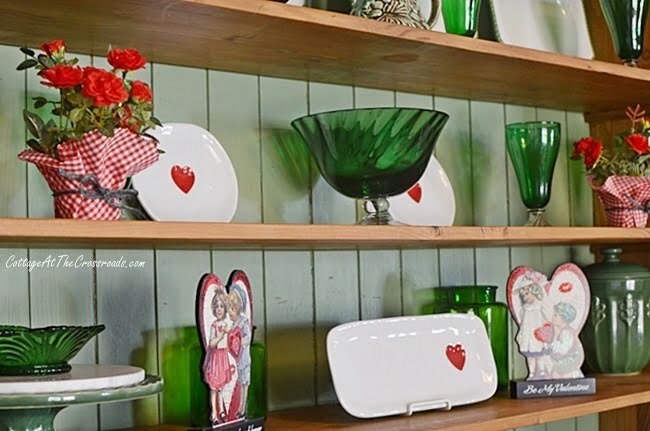 The pine corner cabinet displays a mix of white and green platters that got dressed with some small Valentine’s Day touches. 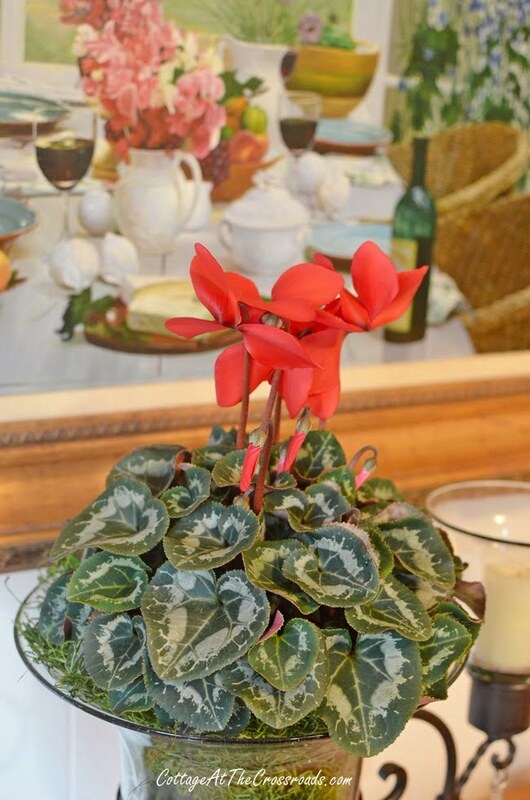 The sideboard is sporting a blooming red cyclamen. It should continue to bloom for the next month or so. I just love its pretty patterned, heart shaped leaves. 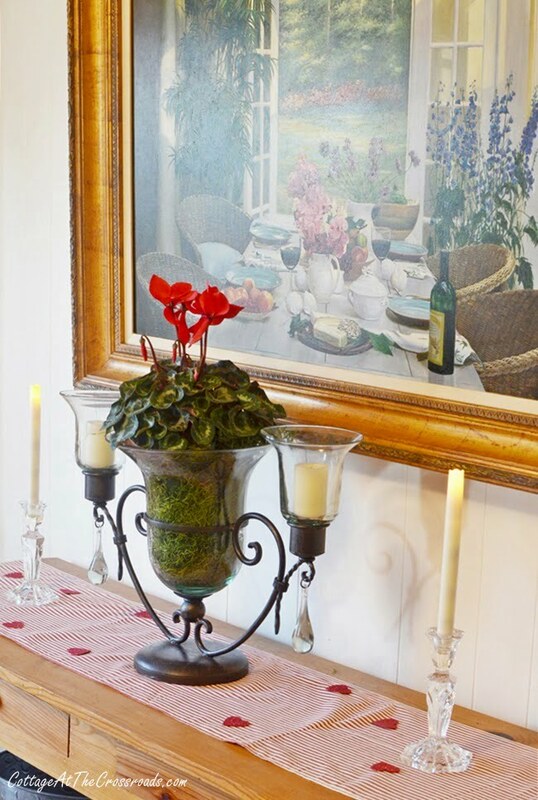 Such a pretty addition to the dining room during this time of year! Yes, love is in bloom around the Crossroads, wouldn’t you say? 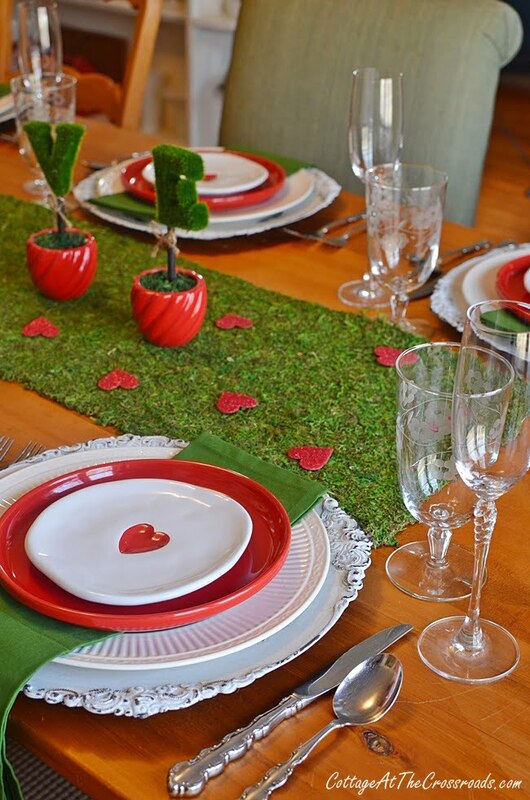 This Valentine’s Day tablescape is ready for a family dinner. 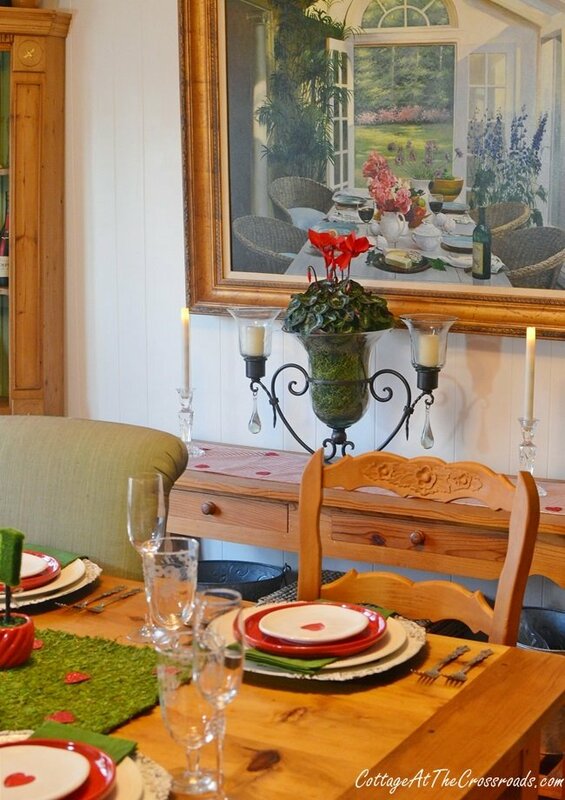 I don’t know of a better way to show your love than preparing a special meal and sitting around a festive table enjoying great conversation! I love your glasses from your mother. I was hoping that I could buy some, but I’m sure they are not to be found. 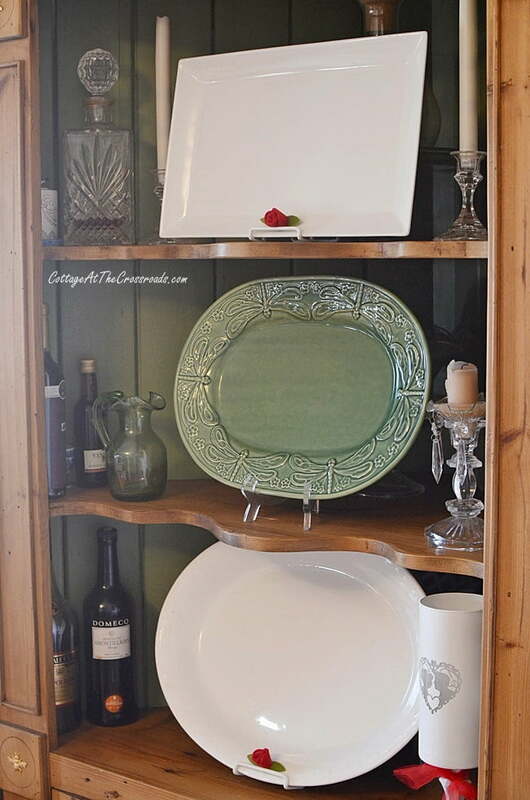 My Granny had the green water glasses & I wish that I would have brought them home with me when she passed away–I love them. Your decorations are so pretty. I like everything that you have decorated with. I’d love to have a meal from those dishes & enjoy your tree etc. HAPPY VALENTINES DAY TO YOU & LEO. Jane, the room is absolutely beautiful! 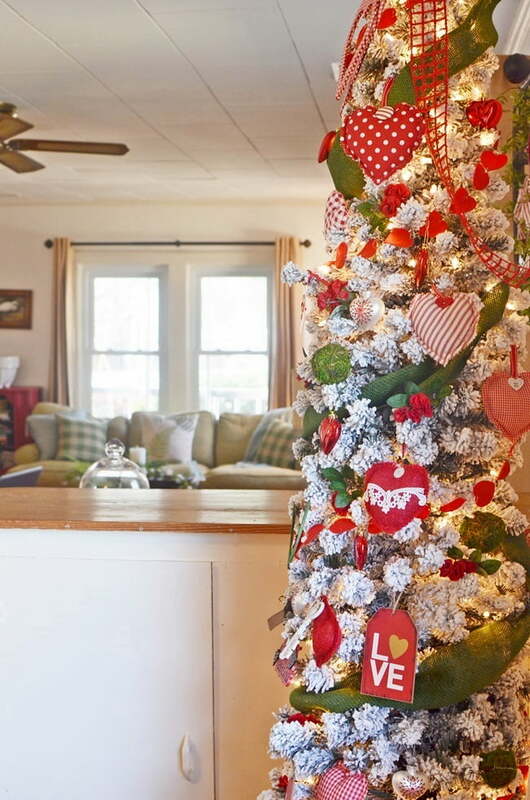 I especially love the tree. It’s such a neat idea!!! Wishing you both a wonderful Valentine’s Day!! An adorable table and hutch. The rose looked real. 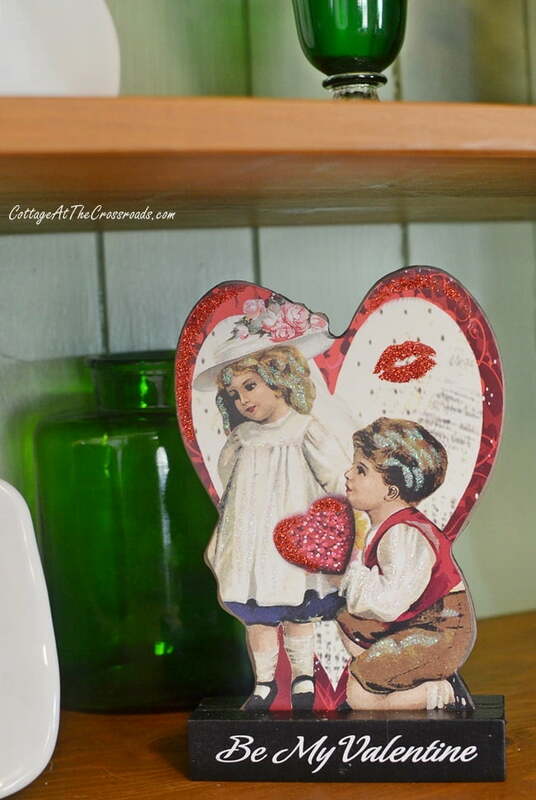 love is definitely in the air at the cottage! Love your table! cheers and happy valentines day.